Welcome to our blog! Competitions, giveaways and more! Great for birthday parties, sleepovers or just to have fun! 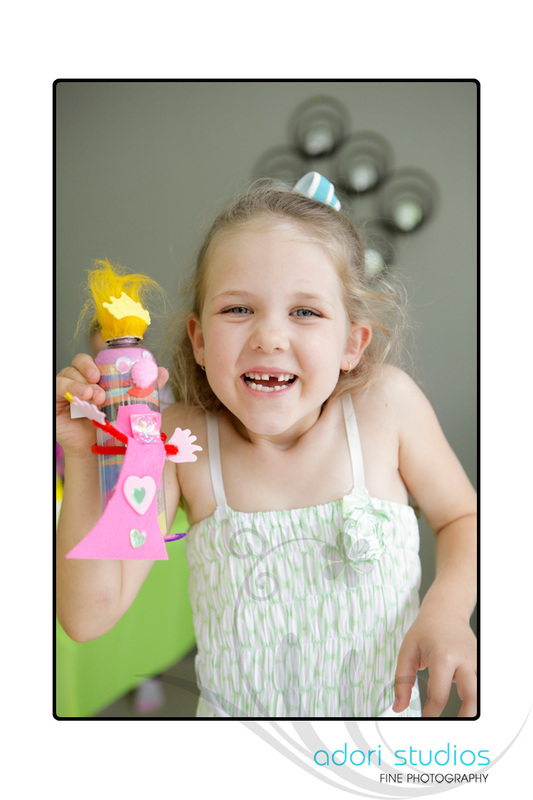 Affordable and easy, a great keepsake of your special day. 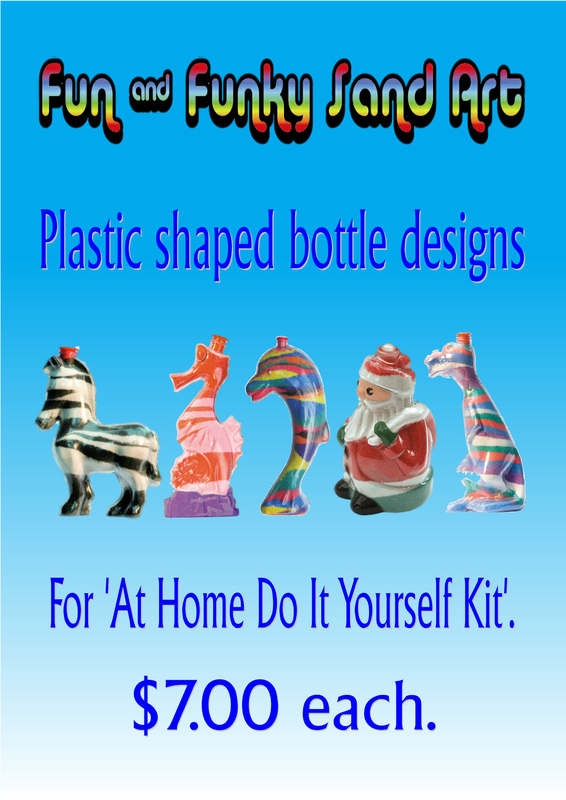 Plastic bottle of your choice; fun faced or shaped bottle designs. Complete with coloured sands to fill, spoons, funnels and full instruction how to guide. Contact us for free shipping quote or free local delivery on the Sunshine Coast. Recommended for children 3 years and over due to small craft parts enclosed. 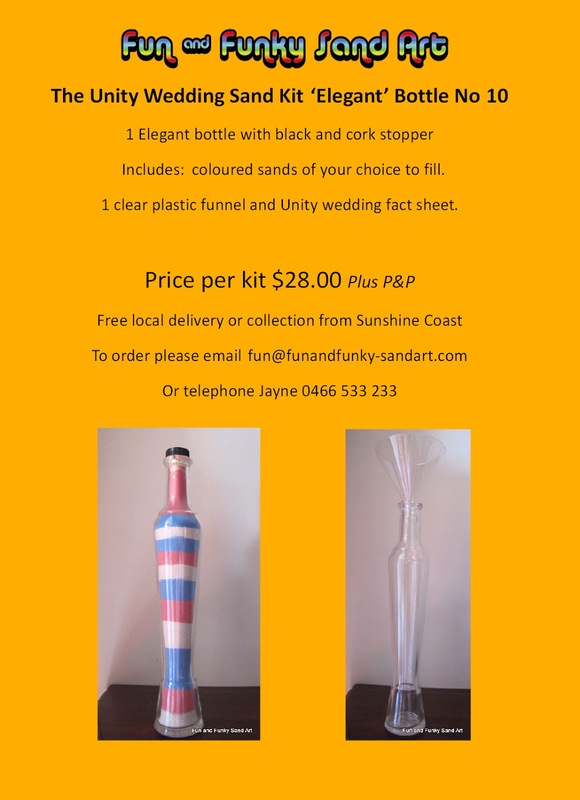 To order please email fun@funandfunky-sandart.com and state which bottle type and quantity required along with your postcode for your free shipping quote. Fun faced plastic sand bottles complete with funky pom pom style hair, eyes and nose! Unity Wedding Ceremony sand kits and coloured sands. 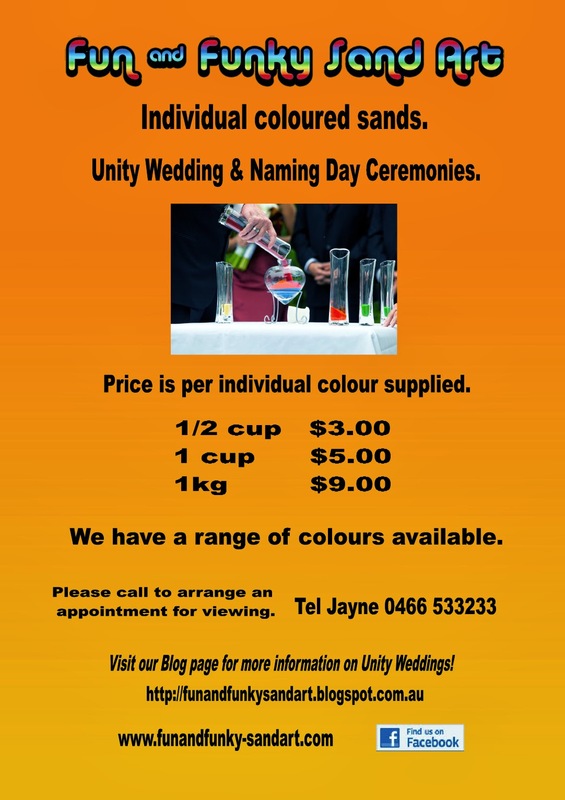 Individual Coloured Sands for Unity Weddings & Naming Days. please call to arrange an appointment we are located near Nambour. Please note sand colours may vary in colour to that shown. New shaped sandart bottle for 2014! 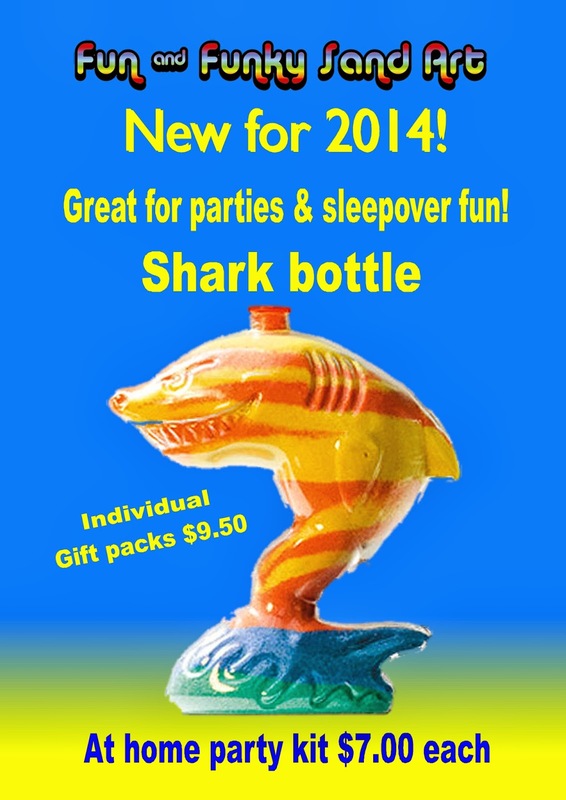 The shark shaped plastic sand art bottle! and kids who just want to have fun! Minimum order 5 x bottles. 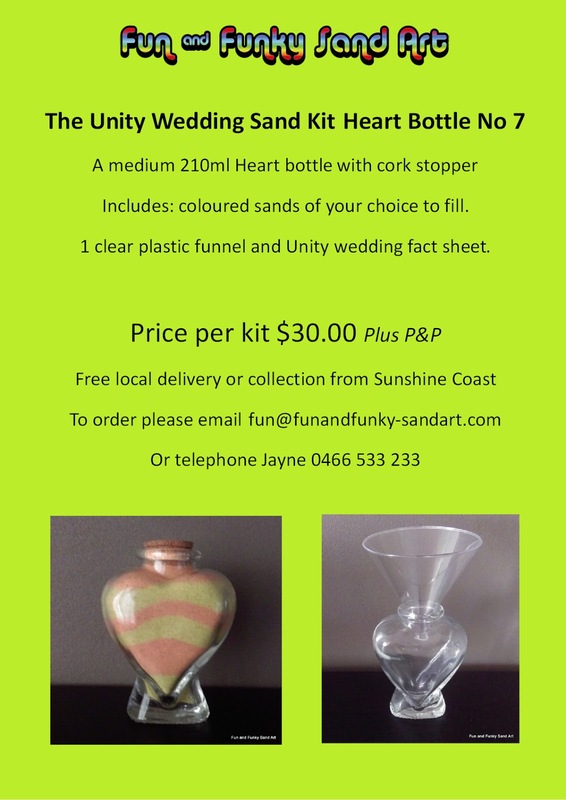 Flat rate shipping fee Australia wide, free local Sunshine Coast delivery. Plastic shaped bottle with small push in stopper. Includes coloured sands, spoons, funnels, Instruction how to guide. 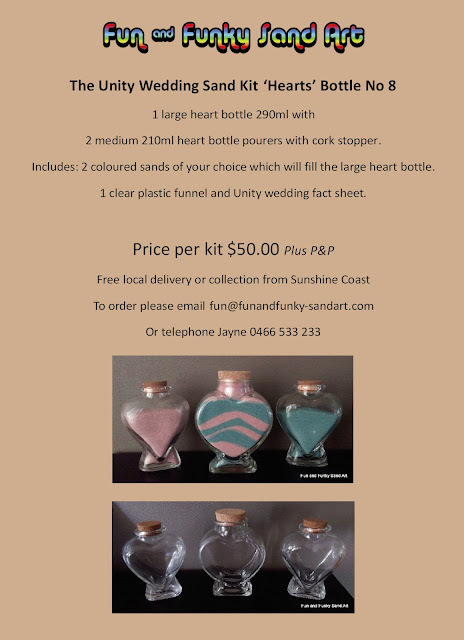 Kit is supplied loosely in one box with everything required to make your own sand art bottles for your event. Recommended for ages 3 yrs and over due to small sand stopper. To order please email fun@funandfunky-sandart.com and state which bottle type and quantity required for a free shipping quote. 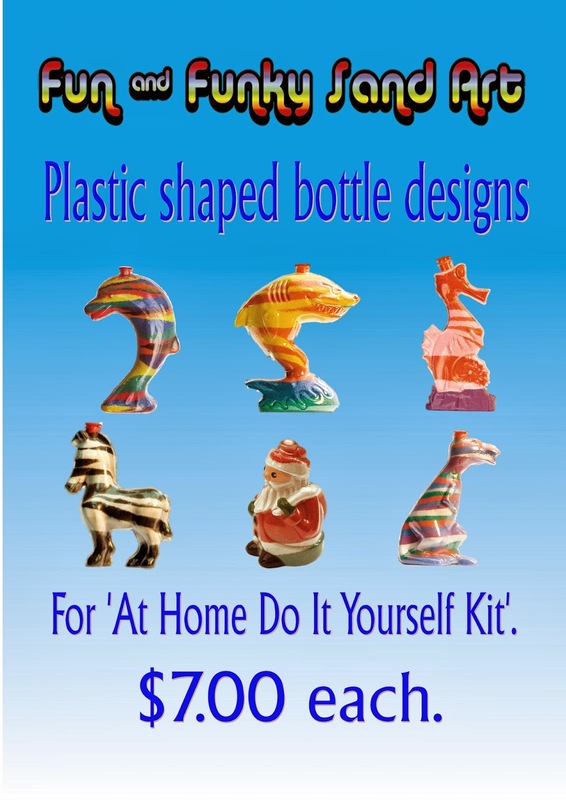 See our other shaped bottle designs! Win the Ultimate Kids birthday party!! Your kids will love you even more and love this too if you win the Ultimate kids birthday party for them!! to bring you the ultimate kids party! Sunnycoast Kids website to enter! For your chance to win big!! 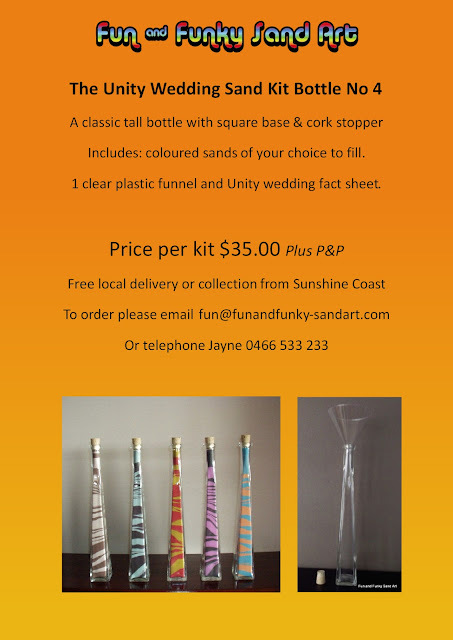 We have teamed us with some other fabulous Sunshine Coast businesses to bring you this awesome prize. To enter simply go to the link on Sunnycoast Kids website or follow the link on our Facebook wall! Welcome to our 6000 Facebook page giveaway! fun@funandfunky-sandart.com within 72 hours of this giveaway ending. The winner was chosen by Rafflecopter. I would like to say a big thank you to each and everyone of you that has liked our page and supported our business! along with Instruction how to guide. PLUS Free postage to Australian residents! To gain 5 entries simply share the giveaway with your facebook friends and family. To do so Click here (click onto the link and you will be redirected to our facebook page). 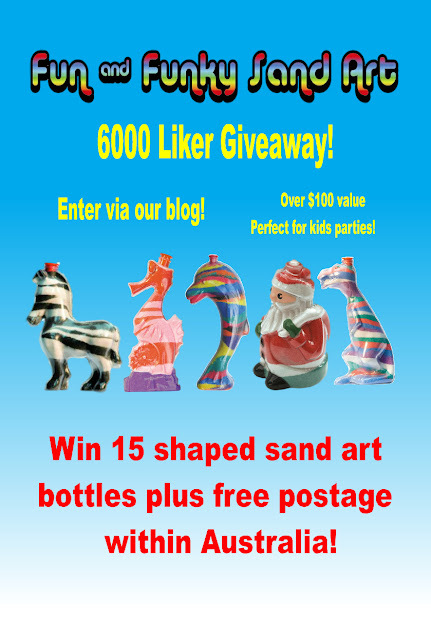 (to public share select share and then choose the public option to ensure I can see it) in your status type 'Fun and Funky Sand Art are giving away '15 funky shaped sand art bottles' perfect for kids parties to enter pop over to their page!! Once you have shared the photo on our facebook page return here and enter your name on the Rafflecopter application below, follow the prompts. click on the first entry titled share the 6000 liker photo via facebook. Click done. Please note, I will check that you have shared the photo via facebook so please do not click 'done' unless you have done so, or your entry will be void. If you are new to our Facebook page, simply like our page to gain another entry into the giveaway! Winner will selected by Rafflecopter and will be announced on our blog! Anyone can enter however the prize includes free postage to Australian residents only, all other Countries, you will have to pay shipping fees. The winner will be chosen at random by 'rafflecopter' and due to Facebook rules will be announced on our blog within 24 hours of the giveaway ending. The winner must claim their prize within 48 hours of the winner being announced. No cash alternative, prize is final. This Giveaway is no way sponsored, endorsed or associated with Facebook. Having a kids party? these cute bottles are a great fun activity. 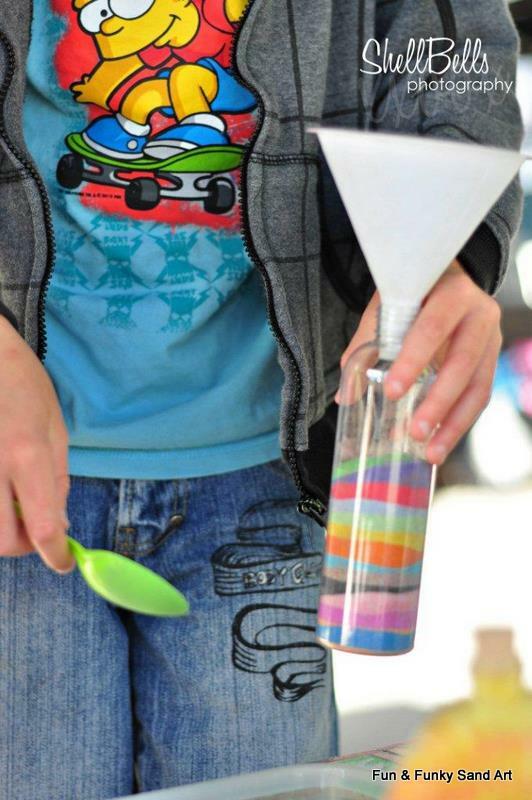 Using a funnel and spoon fill the bottles with different coloured sands to make fun and funky designs! they have their very own present to take home! We also have fun faced bottles please refer to having a kids party on our blogger for more details, filed under April 2012. Choose from Pony/Zebra, Seahorse, Dolphin, Santa and dinosaur. Each bottle is plastic with a push in stopper. 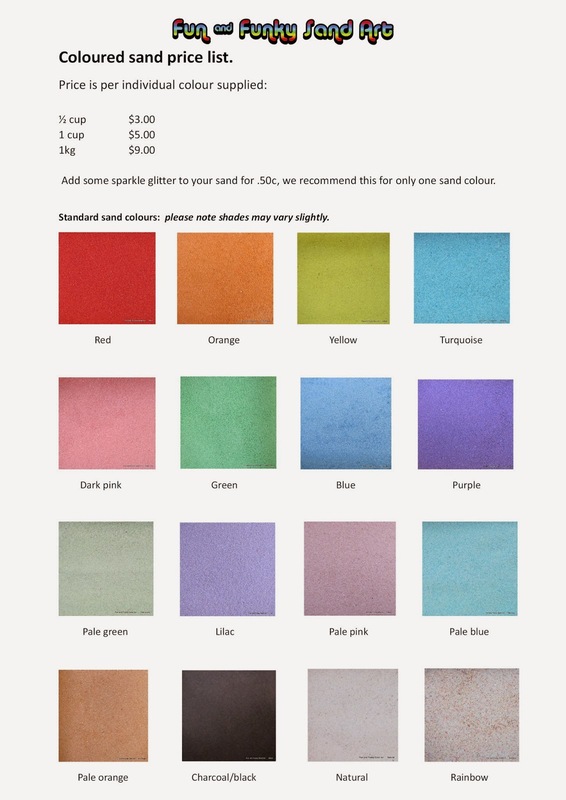 Coloured sands- you will be supplied with one colour per bottle ordered. For example 8 bottles, 8 colours upto a maximum of 16 colours. Sands are supplied in sealed plastic bags for easier shipment, if specific colours are required please advise at time of ordering. Full instruction how to guide. 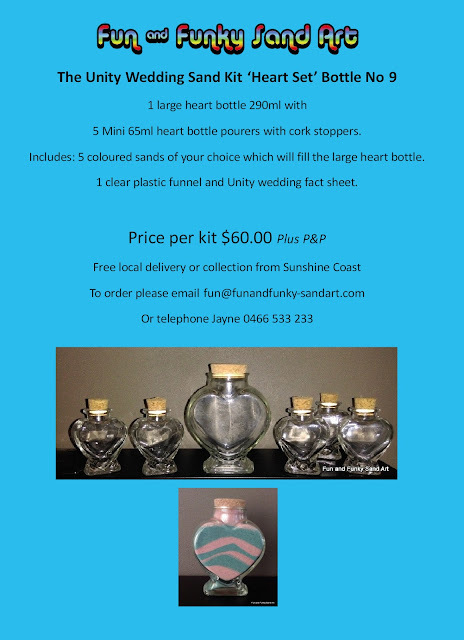 Please state which bottle type, quantity required along with your postcode for postage quote, we can deliver on the Sunshine Coast. Recommended for ages 3 years and up due to small stopper. Are you a school vacation care co-ordinator looking for a fun vacation care programme for the kids that's interactive, affordable and great for all ages? and the best part is the kids love it! We can supply you with a vacation care kit which includes all the materials to make your own sand bottles, we can post our kits nationwide. For Sunshine Coast areas we also offer hosted vacation care programmes which includes a member of staff to organise, set up and clear up! We also have a craft bottle option, please see below for more details! Want to host your programme yourself? 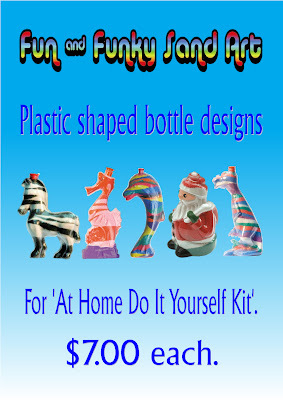 We can supply you our own 'Vacation care do it yourself kit' which enables you to make your own sand bottles. 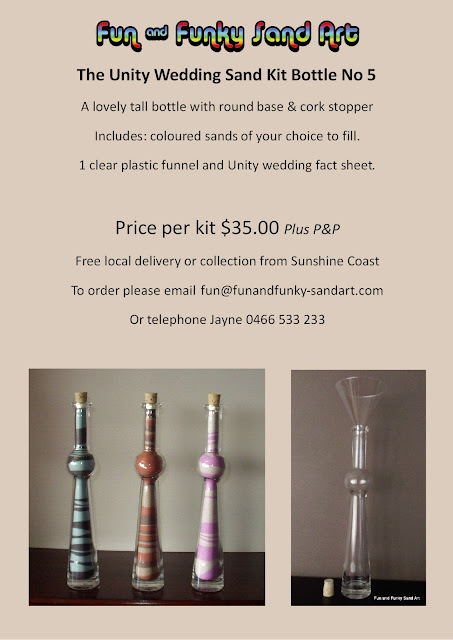 Fun faced bottles with supplied pom pom style hair and crafts. spoons with full easy instruction how to guide. We can deliver locally on the Sunshine Coast, for all other areas please email us at fun@funandfunky-sandart.com with your postcode for a free shipping quote or for further information. Please note this kit is only available for schools, kindergartens and kids clubs. We can come along and host your event for you. We supply all materials, equipment and one member of staff, we are blue card accredited and hold Public and Liability Insurance. Minimum number of bottles/guests 15, travel surcharges may apply. Children fill their own sand bottle using a funnel and spoon at our supplied sand table which holds 16 different colours, once full they then choose which colour hair, eyes and nose for a fun face or you can leave the bottles plain if desired. Thank you to Adori studios, Mooloolaba for capturing this gorgeous pic! This is our most popular option for hosted vacation care programmes. 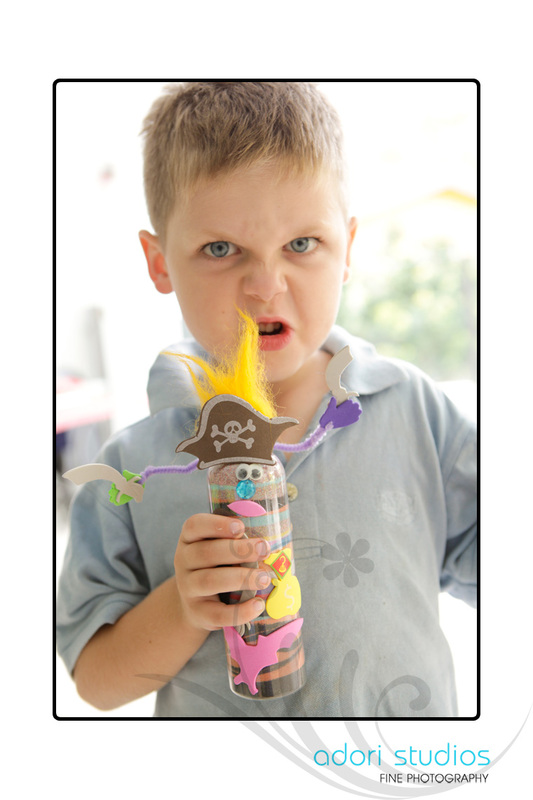 Once the children have finished filling their bottle with coloured sand, they choose which colour hair they require and then have great fun using their own imaginations by decorating their sand bottle with an array of crafts at the additional supplied craft table. 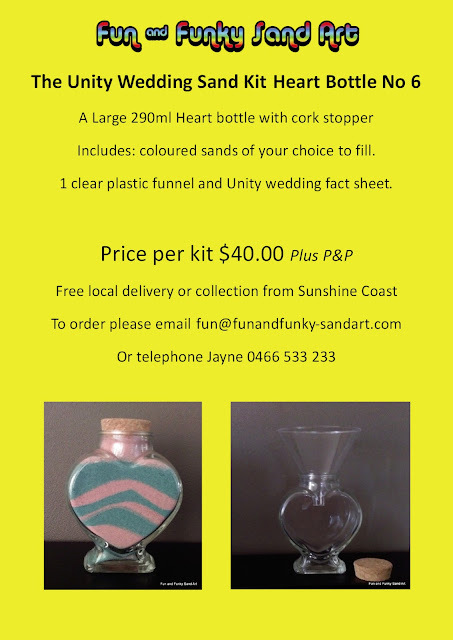 Please email us at fun@funandfunky-sandart.com or telephone Jayne 0466 533 233 for all bookings and inquiries. Please book early to avoid disappointment!